For instance, as of January 1, recreational marijuana use is legal in California. I can’t help but wonder how this is going to affect our traffic problems. I think I know: Now, more than ever, California drivers will seldom leave a turn unstoned. Ba-dump-bump. Thank you. I’ll be here all week. Tip your waiters on the way out. And the foundations of great fiction remain solid and true. You still need a character and you still need a plot. A plot is the stuff that happens to a character that forces him into a battle requiring strength of will. If you don’t have those elements, you don’t have a story. You might have a slice of life, or a character study. You might even have an “experimental” novel, which is also defined as a novel no one reads. But also realize that conditions around you change, which may require applying the fundamentals in a slightly different way. Case in point: The Golden State Warriors. Basketball fundamentals include dribbling, shooting, passing, setting screens, playing defense. A coach figures out ways his team can do these things to create high-percentage shots and stop the other team from doing the same. In the “old days,” the ideal offense was designed around a dominant big man, like Bill Russell, Wilt Chamberlain, or Shaquille O’Neal. But things have changed because of a couple of kids named Steph Curry and Klay Thompson. 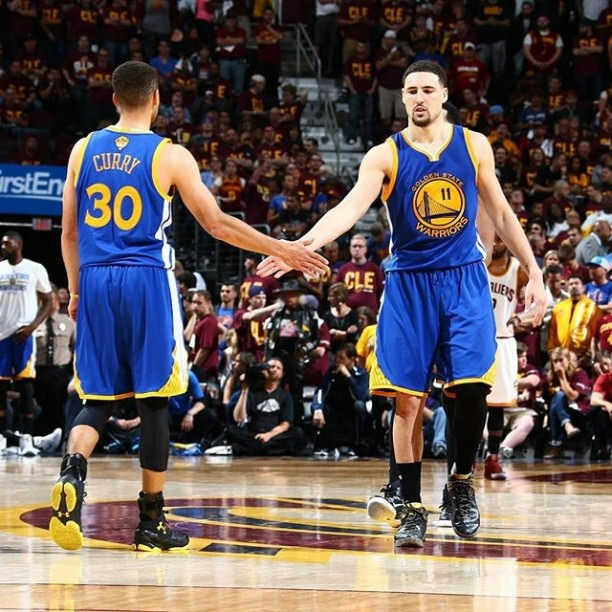 These are the two guards on the Golden State Warriors, and they are the best three-point shooters I’ve ever seen. They have made the Warriors the pre-eminent team in the NBA by virtue of their ability to score from twenty-five feet or more. Now, common sense would tell you that a fifteen-foot jumper has a better chance of going in than a twenty-five footer. And you’d be right. But sports has been taken over by analytics, and the numbers say that a three-point shot, even at a lower percentage, has a higher overall value than a two-pointer. You can look it up. What’s happened as a result is that the NBA has become three-happy. A big man doing battle below is no longer seen as essential to a championship. Indeed, it may be a liability. If you’re a seven-footer these days, you’ve got to be able to fling the rock. Broad and bulky has been replaced by lean and lithe (e.g., another Warrior, Kevin Durant). The antiquated notion of trying to get close jumpers, layups and dunks has given way to schemes designed to spring shooters outside the arc. The same fundamentals (passing, screens, shooting) are in play, but applied in a different way. Which brings us back to fiction writing. When a girl leaves her home at eighteen, she does one of two things. Either she falls into saving hands and becomes better, or she rapidly assumes the cosmopolitan standard of virtue and becomes worse. Of an intermediate balance, under the circumstances, there is no possibility. The city has its cunning wiles, no less than the infinitely smaller and more human tempter. There are large forces which allure with all the soulfulness of expression possible in the most cultured human. The gleam of a thousand lights is often as effective as the persuasive light in a wooing and fascinating eye. Half the undoing of the unsophisticated and natural mind is accomplished by forces wholly superhuman. A blare of sound, a roar of life, a vast array of human hives, appeal to the astonished senses in equivocal terms. You almost never see this style today. Hemingway—the Steph Curry of his day—exerted tremendous influence in the 1920s by way of character-centric minimalism (the very opposite of what Dreiser did, above). By the 1990s, the trend was toward immersive (or deep) POV, which keeps author voice out entirely (unless that voice is itself the point of the novel, e.g., Tom Robbins, Douglas Adams). “Off again, major,” Sandra said resignedly . . .
“Not a scrap of evidence left behind,” Mr. Long optimistically informed the party . . .
“That depends,” answered Thomas consideringly . . .
Ack! Do that now and your book is likely to be set aside contemptuously. So … what are the current conditions for the writer of fiction? We all know attention spans are shorter and demands for our time and money louder and more pervasive. Which means getting and holding the attention of the reader from the jump is a major challenge. Is your POV consistent and immersive? Is your dialogue crisp and compressed? Can it stand alone without being propped up by adverbs? Is your structure solid? When your book starts to “drag,” do you know why and how to fix it? Are your scenes organic? Do they all have a connection to the overall plot? Do you know how create “jump off the page” characters? Are you aware of the “speed bumps” that interrupt the fictive dream? We’ve talked about goals and resolutions this week on TKZ. A good thing for the new year. This is my gentle reminder to include craft study on your list. That way, even if you live in California, your books won’t go to pot. What’s something you’ve recently learned about the craft of writing that is serving you well? What’s an area you need to revisit and shore up?